"Ancient Rhodes - Know the history of Rhodes before you cruise travel to Rhodes island in Greece". 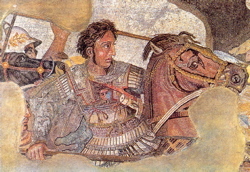 After Alexander the Great’s death, 3 of his generals divided his empire amongst themselves. Ancient Rhodes forged strong ties with the former general Ptolemy and his Egypt. Rhodes and Alexandria developed strong commercial and cultural ties, and formed an allegiance with which they controlled trade throughout the Aegean. The number one item Rhodians exported to the land of the Nile was wine in its famous Rhodian amphorae. Together with grain exports, it was the main source of revenue for the island. But, they didn’t only exchange material goods… they also exchanged big minds. The biggest masters of philosophy, science, rhetorics and literature of those times thought in both cities. However, the power struggle between Alexander the Great’s generals wasn’t over yet and that brought Rhodes to one of the most important points in its history - the siege by Demetrios, son of Alexander’s former general Antigonous. His goal was to cut of Rhodes’ ties with Egypt and he blocked the city by land and sea, and for the first time in history used advanced mighty siege machines. DINING-ROOM TABLE TIDBIT: The largest siege machine built was a tower called the Helepolis (Elepolis). It weighed 360 000 pounds (approx. 163 000 kg), was nine floors high (approx. 45 meters) and needed 3 400 men to operate it. It was completely protected on the outside by large metal plates. After only a year, in 304 BC, Demetrios failed to take the city, departed and left behind him all the siege weapons. 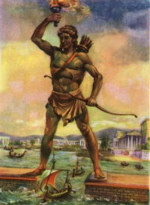 From these came the metal that the Rhodians melted down to construct the Colossus of Rhodes. In 164 BC, Rhodes was forced to become an ally of Rome and thus part of the empire. It became very popular amongst well known and respected Romans who came to Rhodes to study. DINING-ROOM TABLE TIDBIT: One of the arts that flourished in Rhodes was rhetoric and it achieved its peak in the 1st Century BC. Some very well known Romans that studied rhetorics in Rhodes include Julius Caesar, Cicero and Marcus Aurelius. In 42 BC, Rhodes city was captured by the Roman general Cassius (who was one of the leaders in the conspiracy to assassinate Julius Caesar). He completely destroyed the city, removed most of its treasures and sent them to Rome. In 297 AD, the Roman Emperor Diocletian (who built his retirement palace in today’s Split, Croatia) made Rhodes part of his “Provincia Insularum” or “Province of Islands”. It’s interesting to note that in 54 AD, the Apostle Paul visited Rhodes island on his journey from Miletus to Syria. In 395 AD, a long period began of which Rhodes was part of the Byzantine Empire (Eastern Roman Empire), which had become mostly Greek. From the 7th to 9th Centuries, Rhodes became the centre of struggle between the Byzantine and Arab supremacy. After being razed by Persians, sacked by the Arabs, recruited for the Crusades by the French, occupied by the Genoese, recaptured by the Byzant... Rhodes was finally sold to the Order of St. John.